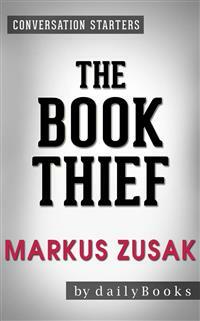 The Book Thief: by Markus Zusak | Conversation StartersA Brief Look Inside:The Book Thief is the fourth novel by author Markus Zusak. The novel gives a unique perspective on World War II by telling the story from the non-Jews of Germany who remained in their country during the war. The novel is narrated by Death, who tells the story of a young girl, Liesel Meminger. Liesel and her brother must leave their mother to live with foster parents, Hans and Rosa Hubermann. What follows is a string of tragic events that causes Liesel to have nightmares. She eventually learns to read with the help of her foster father and finds comfort in words. Unfortunately, the tragedies surrounding Liesel do not end there. She must overcome many more unfortunate circumstances as a child growing up in Germany during World War II. The Book Thief immediately became a New York Times and Amazon.com bestseller, remaining in the top position on both bestseller lists for several weeks. It was also a runner-up for the Printz Award in 2007 and made into a movie in 2013..EVERY GOOD BOOK CONTAINS A WORLD FAR DEEPERthan the surface of its pages. The characters and their world come alive,and the characters and its world still live on.Conversation Starters is peppered with questions designed tobring us beneath the surface of the pageand invite us into the world that lives on.These questions can be used to...Create Hours of Conversation:• Foster a deeper understanding of the book• Promote an atmosphere of discussion for groups• Assist in the study of the book, either individually or corporately• Explore unseen realms of the book as never seen beforeDisclaimer: This book you are about to enjoy is an independent resource to supplement the original book, enhancing your experience of The Book Thief. If you have not yet purchased a copy of the original book, please do before purchasing this unofficialThe Book Thief: A Novel by Markus Zusak | Conversation Starters. We hope you enjoy this complementary guide from dailyBooks. We aim to provide quality, thought provoking material to assistin your discovery and discussions on some of today’s favorite books.